Updated 07/14/2008: I’ve been asked to give my theory a name, and I’ve dubbed it The Aurora Theory. Battlestar Revealed has a great theory available, and some of the points are congruent with my own. If I refine my theory any further in the months ahead, I’ll be sure to update this post with a link. Adama: Starbuck, what do you hear? Starbuck: Nothing but the rain. Adama: Then grab your gun and bring in the cat. By the way, friendly readers, we’re still discussing the latest speculation in the comments over at Thirteen Hints We Know About The Final Cylon. (Feel free to check out all of the Battlestar Galactica posts.) However, we should recap what has been revealed since I wrote that post and Friday night’s mid-season finale. Plus, I have some other thoughts too. Of course. 1. The Fifth Cylon is not in the fleet, according to D’Anna. If this is true, it rules out Dualla, as well as pretty much most of the people about whom we have so far speculated. However, this could mean that the Fifth Cylon was actually on the basestar, and therefore technically not in the fleet, perhaps dead or projecting herself somehow. Remember Moore said that the Final Cylon is also not in the Last Supper photo, so that rules out Roslin and Baltar. Who’s left? Hot Dog. So anti-climactic. I don’t think this rules out Starbuck, though, because there is potential for two Starbucks — the one who went into the nebula at the end of season three and the one who came back from it. I do, however, think Starbuck is quite something else. Read on. So, an episode or two ago the Fifth Cylon was in the fleet, but was no longer in the fleet during “Revelations.” I’m not sure what to make of that. It could really refer to someone on the basestar. 3. The Fifth Cylon has been present since the beginning. Supposedly, the Final Cylon has been on the show since season one, or appeared in season one. This is leading viewers to speculate wildly on all sorts of characters who appeared once in season one. I don’t think there’s much payoff in that. This might indeed relate directly to Lee having to finally eclipse his father, but I think it also applies to the Colonials and Cylons having to let go of the panacea idea of Earth, and their bloody past, before they can see new opportunities in the future. 5. More than one Temple of Aurora? 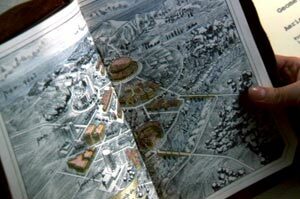 This blogger notices that the depiction of the city containing the Temple of Aurora that Lee is looking at in the beginning of “Revelations” is the same as the depiction Elosha showed to Roslin as the City of the Gods from the Book of Pythia. I’m not sure if that’s significant, or just the writers trying to connect up various plot points and remind viewers that we should be thinking of the City of the Gods and the Temple of Aurora. But you know me, I think Aurora is important. 6. The Fab Four need Google Maps. It’s worth noting that the Fab Four didn’t actually show the Colonials and Cylons the way to Earth as was expected. Kara’s shiny new ship did. Which makes sense since it has supposedly been there already. 7. There’s more than one Big Blue Marble. I don’t think the apocalyptic planet at the end of the midseason finale is actually Earth. In The Original Series (TOS), the Colonials are led by the Beings of Light to a planet they initially think is Earth, but it turns out to be an Earth-like planet called Terra Prime. In the re-imagined series, I think that Starbuck’s shiny new ship came from the Beings of Light (although in the re-imagined series they’d likely be called the Lords of Kobol), and through it they led them to a planet similar to Earth, but not actually Earth. In TOS, the Colonials avert a nuclear war on Terra Prime, but in this new version they don’t arrive in time and the nuclear war has destroyed the planet. Some viewers are certain this planet was in fact Earth, but we didn’t see any recognizable land masses, such as we did at the end of Season 3 in “Crossroads,” and I don’t recognize anything from our Earth in the debris. They are in our vicinity though, because the constellations do match, but that doesn’t mean that the planet they found is in fact our Big Blue Marble. Praetorian1001’s take on Terra/Earth is somewhat similar to mine, and the post has some nice screencaps. Also, SyFy Portal, as usual, has some good spoilery information on this topic. 8. D’Anna’s drawrings. 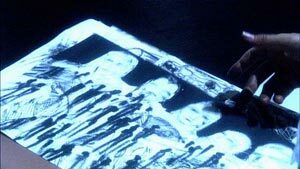 Cujoy has some good speculation on the drawings D’Anna (Three) sketched from her suicidal afterlife experiences in an effort to discover the identities of the Final Five. I think the lyrics “Alone she sleeps in the shirt of man” from Gaeta’s song could refer to D’Anna or the Final Cylon, or even to the original Starbuck. 9. Cry me a river. In the episode “Faith” where Roslin has a vision of the afterlife when Emily Kowalski passes away, I think the river is actually the River Styx. Sure, Baltar is preaching about a river, but the Classical pantheon has always associated a river with the afterlife. 10. That’s one big white rabbit, Roslin. When Roslin hallucinates speaking to the priestess Elosha in the episode “The Hub,” during the Basestar jumps I never assumed she was actually speaking to Elosha across the veil of death. Rather, I assumed Elosha represented (a) a part of Roslin’s psyche brought out by her chamalla use and the altered physics of the jump, or (b) the hybrid, trying to speak to Roslin via the chamalla connection and the jump. 11. Life here began out there. The artifacts, such as the Temple of Five and the Lion’s Head nebula beacon, are getting older as the fleet approaches Earth. The fleet is following a path backwards. These artifacts are older than the exodus from Kobol, which means that they had to be left behind by humans before they settled on Kobol, not when the Thirteenth Tribe left Kobol for Earth. The Thirteenth Tribe was in fact returning to Earth, just as the Colonist and Cylons are now. 12. Who’s your daddy? Daniel Graystone is likely the First Hybrid that Bill Adama and Kendra Shaw encountered in Razor. 13. We don’t need no stinking numbers. Ron Moore stated at the LA screening of the midseason finale that the Final Five do not have model numbers (see here and here). I think their lines are named according to the names of the Lords of Kobol, and Starbuck could be of the Aurora line. So, what does all of this mean? I’ve concocted a back-story and resolution for BSG and it will be interesting to see how close I am to what actually happens in the series. Here’s what I think has happened. Humans leave Earth with 12 AIs/cyborgs onboard, perhaps acting as FTL nav computers similarly to the hybrids on Basestars. Some of the humans are atheists, some are polytheists (of the Classical variety), and a few are monotheists. On the voyage, the three groups come into conflict with one another and the monotheists are labeled or call themselves the Thirteenth Tribe. Among their supporters are six Kobol Lords (the Beings of Light): The Five plus the One Who Cannot Be Named (OWCBN). The Five build the Temple of Five on the algae planet and remain there with the OWCBN while the rest of the fleet settles on Kobol. The Thirteenth Tribe returns to Earth, settling Terra Prime along the way. About 400 years later the Thirteen Tribe writes the Book of Pythia. Roughly 600 years after that, the Thirteenth Tribe creates the Lion’s Head beacon as a pointer to lead them back to Earth. The remaining 6 Lords and the humans settle on Kobol and live in peace. About 1,000 years later the OWCBN goes to Kobol to claim those who worship her/him. The Lords are angry when some decide to follow the OWCBN and the humans are exiled from Kobol. Five of the Lords remain on Kobol and set up the blood price; one lord commits suicide (Athena) and a return map to Earth is embedded in her tomb by the remaining Kobol Lords. The Twelve Tribes of humans form the colonies (taking the Arrow of Apollo with them, which is the key to the map in the Tomb of Athena). The Thirteenth Tribe returns to Earth, possibly with OWCBN. On the return journey, some of them settle on an Earth-like planet, called Terra Prime (the name comes from The Original Series). Others may continue on to Earth, or perhaps they all settle on Terra Prime. About 2,000 years after the Exodus, the Five return to the colonies. They want to fix the problems they created by siding with OWCBN. They help Vergis/Graystone create the skinjobs, versions of themselves, and program these new skinjobs not to think about the Five. The Cylons rebel. The first skinjob created in Graystone’s daughter’s likeness and with her memories, Zoe-R, goes with them as does her father, Daniel Graystone, who becomes the First Hybrid. The Adams family, in attempt to distance themselves from Joseph Adams’ association with the Graystones, revert their surname back to its original Tauron Adama. The Five realize their error, once again, in helping Graystone and embed themselves among the Colonials. They repress their memories in order to better blend in with humans while working toward their ultimate goal: return humans to Earth, stop OWCBN, or both. * The Cylons are unable to recreate skinjobs as complex as the Kobol Lords in that they can’t reproduce, but they also see the differences as improvements, such as being able to download and resurrect, for example. The Cylons are monotheists who worship OWCBN, introduced to this concept by Zoe-R/Daniel Graystone. *Alternately, the Five could still be in cahoots with OWCBN and instead of trying to help the humans, want to convert everyone to monotheism. The first to be embedded would have been Tigh with the other four waiting until later, perhaps. **Or, they have really found an abandoned/destroyed Earth and go on to find Terra Prime. In a recent interview, Edward James Olmos said that the series ending is “dark.” Having the Colonials and Cylons settle on Terra Prime because Earth has been destroyed would satisfy that description. As far as the fifth cylon goes, I seem to remember that supposedly HALF the fleet was on the basestar, or at the very least half the raptors and pilots. So we wouldn’t know for sure exactly who was on the basestar, as far as more minor characters. Although, if the fifth is just a minor character, it wouldn’t be very satisfying. It’s going to be a looong wait for the final 1/2 season. I’m sure we’ll all have many theories running through our minds by the time we know the truth. I know I spent Friday night dreaming about multiple ideas. This show just sticks in your head and has it’s way with you! Ok…I haven’t watched in a LONG time obviously. I think you just gave me yet one more show that I have to go back and get caught up on! I just finished watching the series last night after watching it for the past 6 weeks. All I can say is that it was one of the best shows I have seen. That quote was something that keeps ringing in my ears…when I heard it I had a stream of tears that fell…It was the first time I saw life in that way. Its honest, true, and what I believe sums up a lot in life. Time Immortal » BSG Mid-Season Speculation: Was that Earth?